I recently finished an order of Fanwing Royal Coachman dry flies and some Royal Coachman wet flies along with the drys. The Fanwing Royal Coachman was among the most popular of all fanwing patterns, which grew to popularity in the late 1920’s. A wide variety of existing dry fly patterns were adapted to fanwing versions, largely due to their popularity. Fanwings remained popular through the 1950’s and even into the early 1960’s. The Fanwing Royal Coachman remained on Ray Bergman’s “Favorite List of Dry Flies” in all three of his trout fishing books, covering a time span of twenty years. There’s a few fish stories in that older piece that do not need to be repeated here. Instead I’ m posting these photos: Size #8, #10, and #12. Two dozen Fanwing Royal Coachman Drys, #8, #10, and #12. Tied and photographed by Don Bastian. 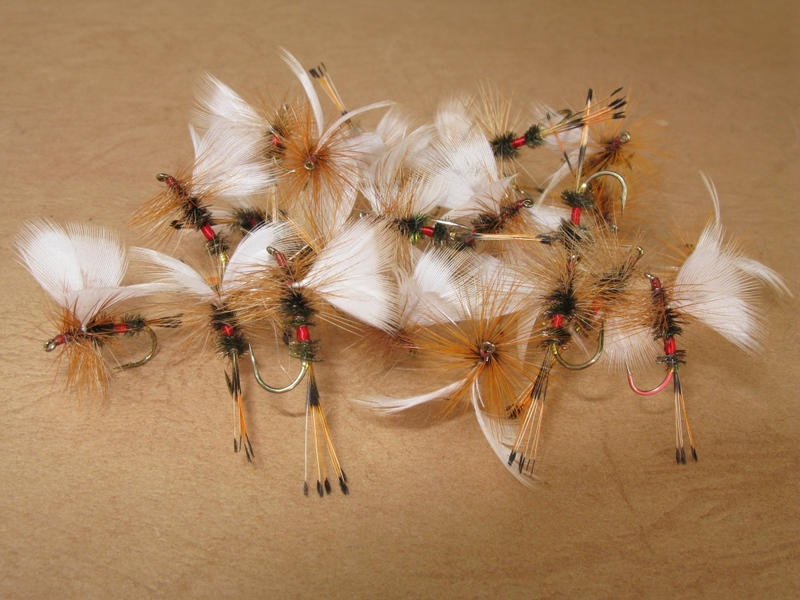 A dozen Royal Coachman wet flies, #6 and #8. 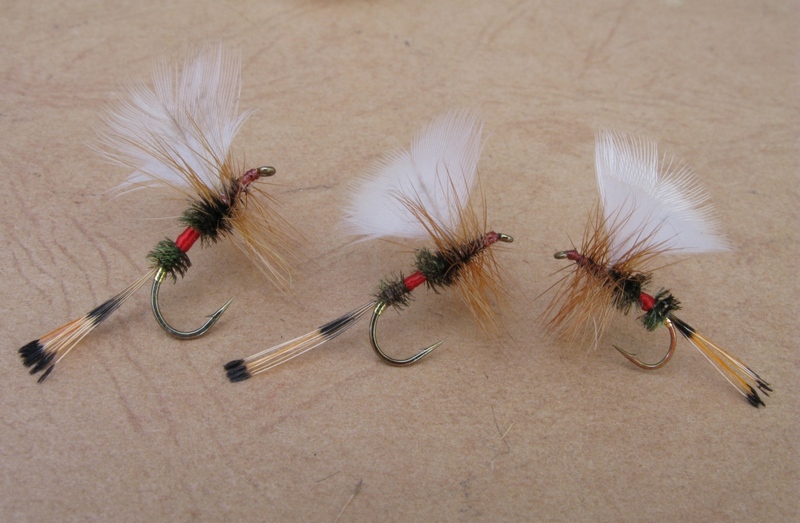 I tied the wings on these in the old-school- traditional style that was popular in the 19th century. The original version of the Royal Coachman wet fly had a tail of barred wood duck, but the Federal Migratory Bird Act of 1918 put an end to that. I’m guessing at that time the present golden pheasant tippet fibers for tail came into use for this pattern, since wood ducks, hunted to near-extinction, along with the wide-scale 19th century logging that severely reduced their favored nesting sites – tree cavities, were given national protection and were not legally hunted nationwide until 1959. All carded up to make them look nice for my customer. Hackles on the wets are hen, wound as a collar. White duck wing quill sections on the wet flies, and white male wood duck breast feathers on the fanwings. There are tinsel tags on both dry and wet patterns, and the body is red floss and peacock herl. This entry was posted in Dry Flies and tagged Fanwing Royal Coachman, Royal Coachman. informative, educational, and inspiring….as usual! Thank you very much for your complimentary remarks and comments! Beautifully done Don , as usual ! Thanks for your comment and compliments! Thank you very much for your compliment Dennis! 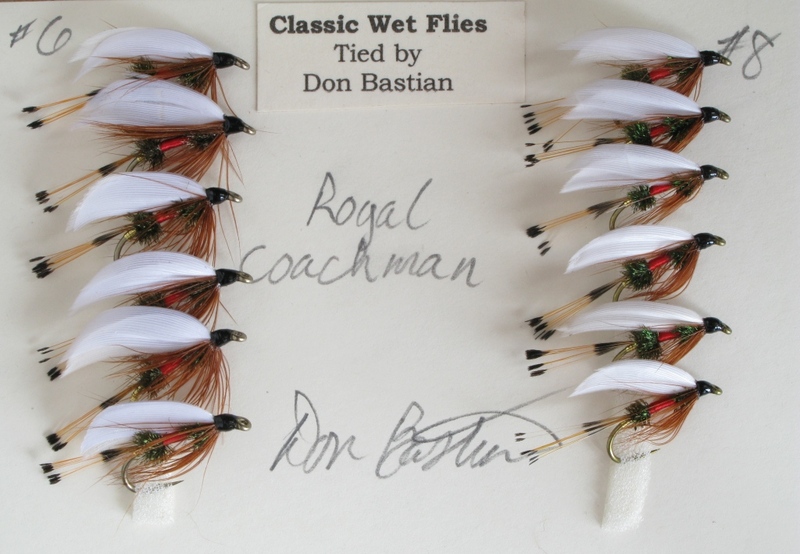 Don, I still have 6 Royal coachman wets I bought from you at Marlboro, MA fly show in 2007; I could fish them but think they will be even more valuable as a conversation piece: “flies tied by a friend of mine”! I remember packing those up! There were a half-dozen flies in a little sleeve pack. Kinda cool that you never fished them and still have them. Thanks for sharing that! I love any form of the Royal Coachman! Brilliant work here Don. Loved the photos and history. Top notch as usual! Thanks for sharing this today. I have to admit the Royal Coachman Fanwing is probably my favorite dry fly, not just because it catches fish, but it’s so darn pretty to look at! Glad you enjoyed the article, thanks for your comments! Thanks Bill! Glad you like! The Coachman is the perfect example of the attractor patterns of the old wet flies working perfectly well as dry patterns. 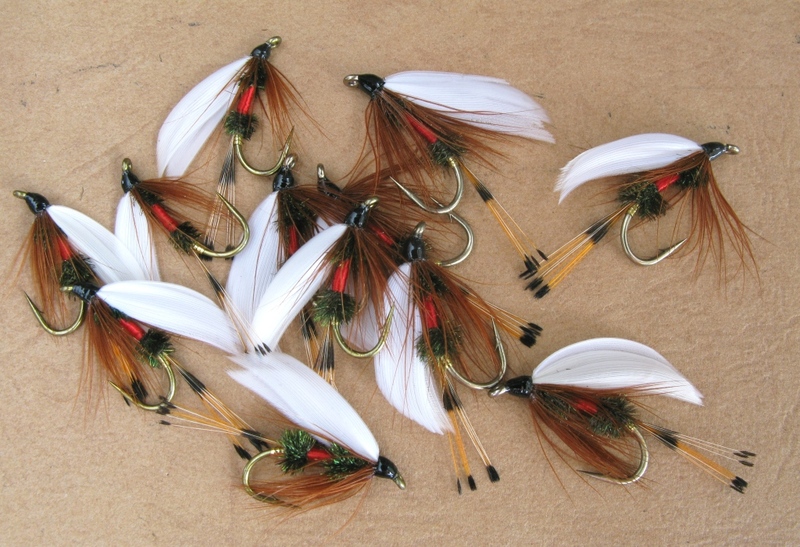 I wonder why more of the old wet flies didn’t make the transition, such at the Belle? Any thoughts Don? Actually, I have seen the Parmacheene Belle as a fan wing dry fly. The tail was red and white fibers, the hackle was red and white mixed, with the wings just being white. Many other wet flies were made into drys and fan wing drys: Professor, Scarlet Ibis, Gold-ribbed Hare’s Ear, Grizzly King, Yellow Sally, Rube Wood, Queen of the Waters, etc. Thanks for your comment and I’m glad you enjoyed the article!